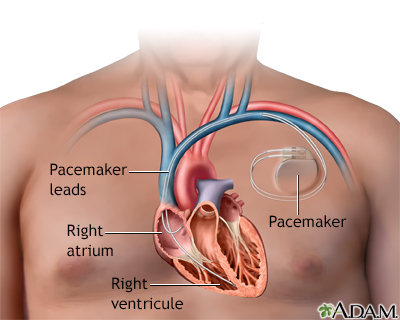 A pacemaker is a small, battery-operated device that senses when your heart is beating irregularly or too slowly. It sends a signal to your heart that makes your heart beat at the correct pace. This article discusses what you need to do to take care of yourself when you leave the hospital. Note: Care of certain specialized pacemakers or pacemakers combined with defibrillators may be different than described below. You had a pacemaker placed in your chest to help your heart beat properly. A small cut was made on your chest below your collarbone. The pacemaker generator was then placed under the skin at this location. Leads (wires) were connected to the pacemaker, and one end of the wires was threaded through a vein into your heart. The skin over the area where the pacemaker was placed was closed with stitches. Most pacemakers have only one or two wires that go to the heart. These wires stimulate one or more of the chambers of the heart to squeeze (contract) when the heartbeat gets too slow. A special type of pacemaker can be used for people with heart failure. It has three leads to help the heart beat in a more coordinated manner. Some pacemakers also can deliver electric shocks to the heart that can stop life-threatening arrhythmias (irregular heartbeats). These are called "cardioverter defibrillators." You should know what type of pacemaker you have and which company made it. You will be given a card to keep in your wallet. The card has information about your pacemaker and includes your doctor's name and telephone number. It also tells others what to do in case of an emergency. You should always carry this wallet card with you. It will be helpful to any health care provider that you may see in the future because it says what kind of pacemaker you have. You should wear a medic alert bracelet or necklace that says you have a pacemaker. In a medical emergency, health care workers taking care of you should know you have a pacemaker. Most machines and devices will not interfere with your pacemaker. But some with strong magnetic fields may. Always ask your provider about any specific device that you need to avoid. DO NOT put a magnet near your pacemaker. Most appliances in your home are safe to be around. This includes your refrigerator, washer, dryer, toaster, blender, computers and fax machines, hair dryer, stove, CD player, remote controls, and microwaves. Tell all providers that you have a pacemaker before any tests are done. Some medical equipment may interfere with your pacemaker. DO NOT put it in a pocket on the same side of your body as your pacemaker. When using your cell phone, hold it to your ear on the opposite side of your body. Be careful around metal detectors and security wands. Handheld security wands may interfere with your pacemaker. Show your wallet card and ask to be hand searched. Most security gates at airports and stores are OK. But DO NOT stand near these devices for long periods. Your pacemaker may set off alarms. After any operation, have your provider check your pacemaker. You should be able to do normal activities in 3 to 4 days. DO NOT lift this arm above your shoulder for several weeks. DO NOT wear clothes that rub on the wound for 2 or 3 weeks. Keep your incision completely dry for 4 to 5 days. Afterward, you may take a shower and then pat it dry. Always wash your hands before touching the wound. Your provider will tell you how often you will need to have your pacemaker checked. In most cases, it will be every 6 months to a year. The exam will take about 15 to 30 minutes. The batteries in your pacemaker should last 6 to 15 years. Regular checkups can detect if the battery is wearing down or if there are any problems with the leads (wires). Your provider will change both the generator and battery when the battery gets low. Your wound looks infected (redness, increased drainage, swelling, pain). You are having the symptoms you had before the pacemaker was implanted. You feel dizzy or short of breath. You have hiccups that DO NOT go away. You were unconscious for a moment. Knops P, Jordaens L. Pacemaker follow-up. In: Saksena S, Camm AJ, eds. Electrophysiological Disorders of the Heart. 2nd ed. Philadelphia, PA: Elsevier Saunders; 2012:chap 37. Swerdlow CD, Wang PJ, Zipes DP. Pacemakers and implantable cardioverter-defibrillators. In: Zipes DP, Libby P, Bonow RO, Mann DL, Tomaselli GF, Braunwald E, eds. Braunwald's Heart Disease: A Textbook of Cardiovascular Medicine. 11th ed. Philadelphia, PA: Elsevier; 2019:chap 41. Wilber DJ. Electrophysiologic interventional procedures and surgery. In: Goldman L, Schafer AI, eds. Goldman-Cecil Medicine. 25th ed. Philadelphia, PA: Elsevier Saunders; 2016:chap 66.